When looking for books on gardens in an average bookstore, one normally makes two interesting discoveries: First, judging by all the amounts of books written on gardens in Europe and the US, and perhaps some on gardens in Japan and China, one might get the impression that nowhere else in the world people used and use to cultivate gardens. Second, the books are mainly focused on garden design and descriptions of plants. How people experience gardens, what they think about them and how they live with their gardens is seldom described. Southeast Asia and especially Thailand belong to those “blind spots” concerning gardens, both from academic and public point of view. Although hardly known in other parts of the world, Thailand indeed has a garden tradition which can be roughly divided in traditional or symbolic gardens (found in palaces and temples), where for example lotus ponds and the sculpture trees (maidat) are an important feature, and functional gardens (the gardens of ordinary people), with vegetables, fruit trees and herbs. Ornamental gardens, nowadays often found in hotels, resorts and private gardens, as well as botanical gardens came quite late to Thailand, only within the last twenty to thirty years. Today, many Thai gardens can be described as a mixture between the above mentioned gardens. Especially for the Thai middle class, gardens have turned from a necessity to a free time activity and sometimes even to a status symbol. Even if it is not necessary, many Thai people still like to grow herbs, bananas and papaya in a kitchen garden. 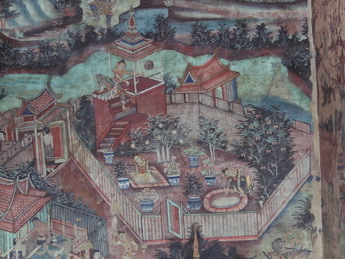 Other important features in contemporary gardens are decoration elements like Thai pavilions (salaa) and different sculptures, ponds or water bowls with water lilies and/or lotus, potted plants and so-called lucky plants whose special meaning shall attract personal well-being, luck and happiness. Many of the used plants in contemporary gardens are from South American origin. People like them because they are often more colorful and one can also show that she or he is able to afford those more expensive imported plants. Looking at the popularity of the Royal Projects and the growing concern about the environment (such as in university teaching, in magazines on gardening and so forth), it is quite likely that gardening in an organic way is going to be more and more important in the future. Another interesting aspect is the so-called interiorscaping (from interior and landscaping) with its unbelievably detailed interior landscapes which are not to be compared to what is understood by interiorscaping in, for example, Germany, with its small scale plant-decoration of rooms. Magnificent examples can be admired in many shopping malls in Bangkok. According to Vipakorn Mitaraphibul Thumwimol, a landscape architect specialized in Thai garden history, interiorscaping will become an interesting way to surround oneself with plants as cities grow denser with lesser space for outdoor gardens. For a closer anthropological examination on Thai gardens and society, have a look at my master thesis (6 MB, it is written in German, but an English essay is in preparation). Invernizzi Tettoni, Luca (2008): Ultimate Tropical. London: Thames & Hudson Ltd.
Warren, William (1991): The Tropical Garden. Gardens in Thailand, Southeast Asia and the Pacific. Bangkok: Asian Books. Warren, William (1996): Thai Garden Style. Bangkok: Asian Books. Passionfruits are usually pollinated by huge carpenter bees, but it seems small insects can do the trick as well. Mangosteen may take a long time before they make fruit and do not need pollination at all.